Concrete Pumping TX provides high quality line pumping services and operators to ALL of Frisco and surrounding cities' construction market. We are locally owned and have satisfied customers all over DFW. Call with any questions and to schedule our concrete line pumping services. What Is Concrete Trailer Pumping? A Trailer pump uses a remote controlled arm or hose to place concrete where it needs to go, and they’re often used in various construction projects. Therefore concrete pumps are able to pump concrete at high volumes and are extremely accurate, which is why they are used for larger or small projects. Anyone who has been involved in any sort of construction job knows that labor is a big part of the total expense of the project and obviously, the labor force is integral, but if it can be reduced without affecting quality and safety, it will help boost the bottom line. Therefore the site will seem less congested, and you can also use key personnel for other important tasks when the concrete is placed directly. 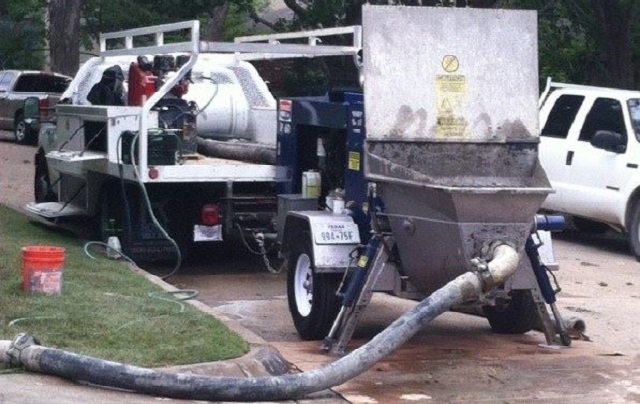 Accurate pumping means fewer stoppages, fewer delays and a more professional-looking end result and company that pours concrete as its main business knows how important it is to present a professional result to the clients and to the public. Many people won’t really notice when a job is done well, but they will certainly notice when there are drips and spills and messy pours. Overall, using either type of concrete pumping system is just more convenient than the old mix and pouring methods. Boom arms can actually reach over top of house or other structures but trailer pumps place the concrete in locations where these types of machinery can’t reach.